on the bicycle traveling the trail. I captain the speedboat, my hand steady on the wheel. those are my limbs also and they are beautiful to me. earned or unearned. I feel it and am content. Have bears left claw marks on the bark? and know that you are beautiful? turn, earth finds an axis. company with Orion–will be forgotten. drank cocoa and smoke made of flowers. the cracked Roman bricks in Carcassonne. like an unbounded universe gathers wings. 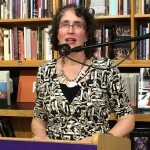 Deborah Bacharach is the author of After I Stop Lying (Cherry Grove Collections, 2015). Her work has appeared in Many Mountains Moving, The Antigonish Review, Literary Mama, and Blue Mesa Review among many others.